Gas & Dust Treatment in the Process of Recycling and Dismantling of Waste PCBs _ PCB recycling machine,cable wire recycling machine,E-waste recycling plant,precious metal refining machine system,E-waste shredder,plastic and metal recycling production line,copper electrolysis system-Zhengzhou Zhengyang Machinery Equipment Co.,Ltd. 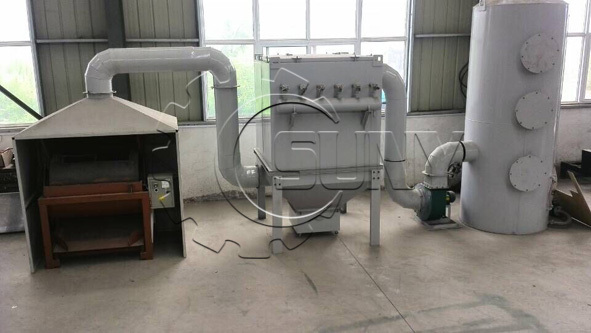 As shown in the above picture, the PCB Dismantling Machine and Gas & Dust Recovery System occupy very small space and have beautiful appearance. Heating is the general method to remove electronic components from waste PCBs. Under high temperature, the base plates, soldered dots and various components will release large amount of tail gases, which are irritant, hazardous, poisonous and even carcinogenic. If not handle them properly, it will cause serious secondary pollution. According to our research, when being heated, the waste PCBs produced phenol and some other kinds of organic compounds following the breaking of O-C, C-C, C-Br bonds in brominated epoxy resins, and also released a large amount of acid gases containing chemical elements such as S, N, Cl and Br. Moreover, heavy metals such as Sn, Pb, Sb, Hg, Cd and Cr escaped from PCBs and melting solder in the continuous tin fusion process. Therefor, gas and dust recovery system is very necessary in the process of PCBs dismantling. Now the capacity of PCB Dismantling Machine can reach 500kg/ph.